And to celebrate the release of their self-titled debut record, Kitten played at The El Rey for their record release show to a packed house of loyal fans. But for those simmering fans charged and waiting to explode, Chloe, dressed in a soft oriental gown, started off slow with the brooding "Why Wait" set to hypnotic beats. It certainly set the mood. With saturated red and blue spotlights softly painted on mesmerized faces; the crowd seemingly knowing this was, in a sense, the calm before the storm. They didn't' have to wait long. 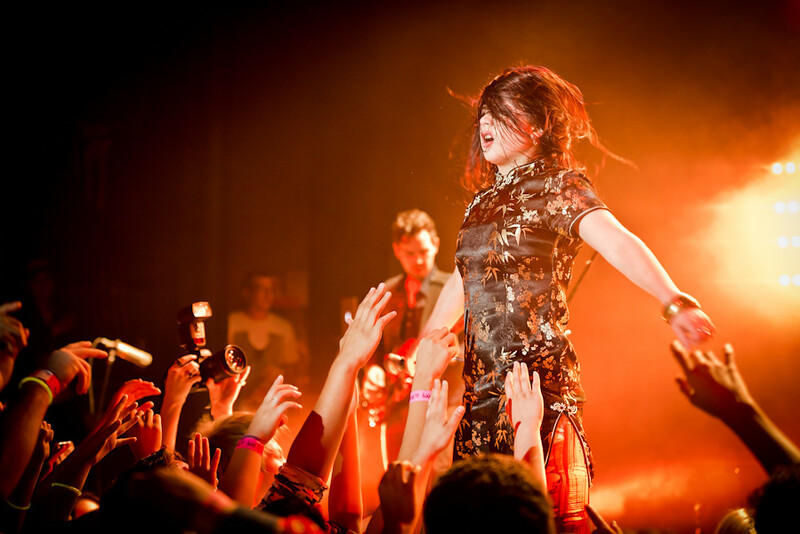 Chloe, soon enough, charged into "Japanese Eyes" off their 2012 Cut It Out EP and on cue, her loyal fans erupted in unison as El Rey's stage barrier, or lack there of, was there to keep the crowd at bay or keep Chloe contained (by the end of the night neither held true.) It's as though Chloe has been harnessing this raw energy up until the curtains opened and, like a switch she turns on at will, escapes in bouts of nervous energy. With the crowd barely containing themselves, there was no turning back. Kitten continued the volcanic barrage with tracks off their new self-released album. Songs "Sensible" and "Like A Stranger" are lush, electro assaults layering driving drums with igniting choruses while "Cut It Out" and "I'll Be Your Girl" revel in soaring melodies laced with a seductive beat as Chloe's vocals barely rise above a tender whisper. I'm sure many fans were jealous when Chloe plucked a lucky fan from the crowd, brought her onstage and serenaded her to the seductive tune of "I'll Be Your Girl." But even though Kitten's raw and electrifying performance brought down the house, it was the more tender songs that hit the hardest. There's an honesty revealed in Chloe's voice that can turn on a dime to confidence yet still sound delicate. Chloe, left alone onstage with only an acoustic guitar, performed "Apples and Cigarettes" and "Kill The Light," effortlessly transforming herself from a commanding and booming onstage-presence to a vulnerable and fragile artist in one quick lighting cue. 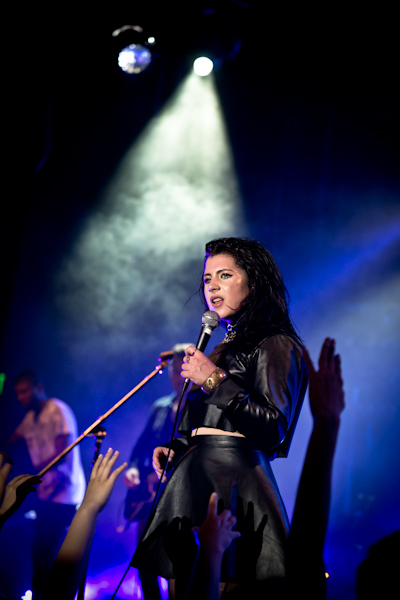 KITTEN performs during their album release party at The El Rey. The high-octane "Kitten With A Whip," a mainstay towards the end of all Kitten shows (and surprisingly not on their debut album) gave the biggest jolt to the sold-out crowd. Chloe took to the side stage, greeted by fans with outstretched arms as she climbed the rafters and then stage-dived into the crowd below whom gently brought her back to the stage. That's when all hell broke loose. 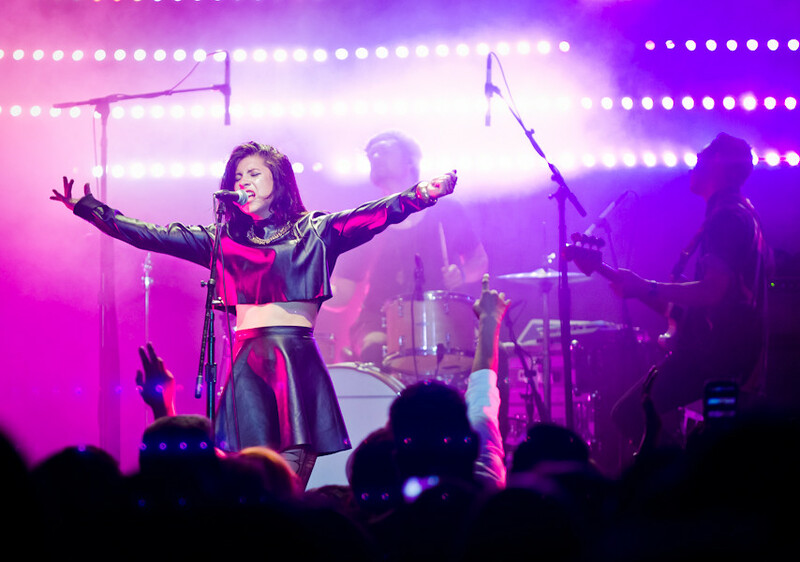 Fans stormed the stage, overtaking security and brought the party onstage to Kitten. It was a fitting end to this special record release show. Certainly a roller-coaster ride from beginning to end, Kitten's ride continues when their debut album is released Tuesday, June 24th. They'll be performing a much more toned downed set at Amoeba Hollywood that same day at 6pm for a free show and signing CDs afterwards. "Like A Stranger" by KITTEN.